The Empire State Building is a 102-story skyscraper located in Midtown Manhattan, New York City, at the intersection of Fifth Avenue and West 34th Street. It has a roof height of 1,250 feet (381 meters), and with its antenna spire included, it stands a total of 1,454 ft (443.2 m) high. Its name is derived from the nickname for New York, the Empire State. It stood as the world’s tallest building for 40 years, from its completion in 1931 until construction of the World Trade Center’s North Tower was completed in 1972. Following the September 11 attacks in 2001, the Empire State Building was again the tallest building in New York (although it was no longer the tallest in the US or the world). The Empire State Building was once again demoted to second-tallest building in New York on April 30, 2012, when the new One World Trade Center reached a greater height. 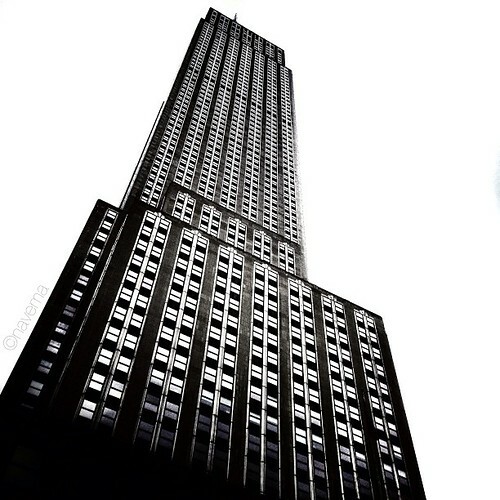 The Empire State Building is currently the third-tallest completed skyscraper in the United States (after the Willis Tower and Trump International Hotel and Tower, both in Chicago), and the 22nd-tallest in the world (the tallest now is Burj Khalifa, located in Dubai). It is also the fourth-tallest freestanding structure in the Americas.